Elisabeth Moss on how The Handmaid's Tale aligns with her Scientology beliefs: "It's a complicated thing"
They (a proverb? the internet? someone smart, probably) say that wisdom is the ability to hold two competing ideas simultaneously, which is why fans of The Handmaid’s Tale might be the wisest motherfuckers of all. 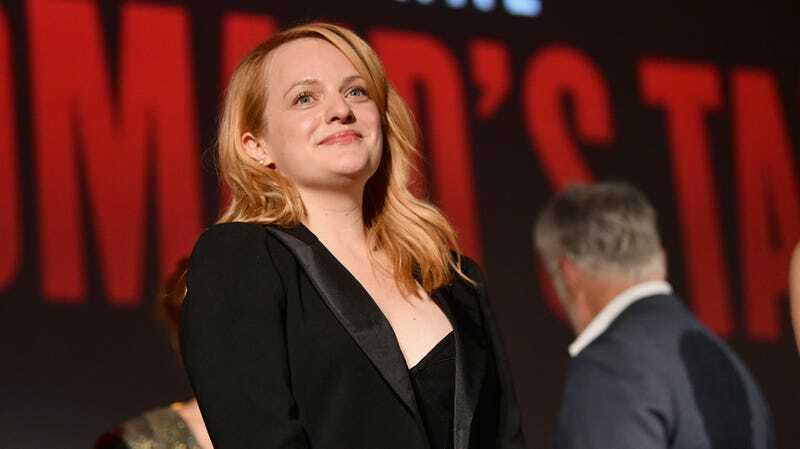 For instance: Elisabeth Moss is phenomenal on the series, which is a fantastic and eerily familiar tale about the societal oppression of women and marginalized groups. Scientology is a dubious religion with troubling views of mental illness and the LGBTQ community. Moss is a Scientologist, and thus the competing ideas co-exist. Sort of. While promoting her role in the new Alex Ross Perry film Her Smell, Moss spoke with The Daily Beast about the perceived clash between the views espoused by her religion and the hit Hulu series in which she plays a rebellious woman living in an oppressive dystopian society ruled by violent misogynists. Listen, it’s a complicated thing because the things that I believe in, I can only speak to my personal experience and my personal beliefs. One of the things I believe in is freedom of speech. I believe we as humans should be able to critique things. I believe in freedom of the press. I believe in people being able to speak their own opinions. I don’t ever want to take that away from anybody, because that actually is very important to me. At the same time, I should hope that people educate themselves for themselves and form their own opinion, as I have. It’s funny, there’s two things you’re never supposed to talk about at a dinner—politics or religion—and of course I’m doing The Handmaid’s Tale, which is politics and religion, so it’s a strange situation where you’re going to be asked about these topics. I choose to express myself in my work and my art. I don’t choose to express myself about it in interviews. I don’t choose to talk about not just religion, but my personal life—who I’m dating and that kind of thing. So for me, it’s so hard to unpack in a sound bite or an interview, but I will say that the things that I truly believe in are the things that I’ve mentioned, and I think that they’re very important. Still, the beginning of that answer kind of hits the nail on the head with regards to why people continue to criticize Moss’ involvement in The Handmaid’s Tale and why they continue to interrogate how her religious beliefs may be incongruous with the stories she’s telling. The Handmaid’s Tale is a political series, one that feels particularly profound and depicts a reality that seems disturbingly plausible. As author Margaret Atwood has explained, there’s nothing in the novel that hasn’t actually happened to women somewhere in the world. There’s a reason why this story is so chilling and effective. Moss admits “questions about these topics” are unavoidable, so one might (reasonably) assume that she’d come to the table better prepared to deal with this line of inquiry.